With council from Van Wert County weather specialist Rick McCoy and other observations, the “go” was given to leave on Friday morning. Much of the energy for the Nebraska outreach came from the listening ear of 20-year-old Lincolnview graduate Tristin Miller. Miller eventually became one of the leaders of the effort. Miller said that he sowed seeds for such an effort on Facebook. To his surprise, the positive response was overwhelming from individuals who gave donations, volunteered to assist with such a trip, and organize other matters concerning the journey. A major portion of manpower for the caravan came from a joint effort between individuals in Van Wert and Paulding counties. 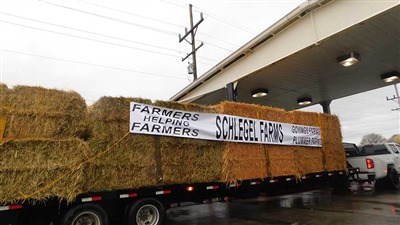 Support from residents of both Paulding and Van Wert counties contributed huge amounts financially, goods such as cattle feed, and other items that would help support the trip. Miller said the destination for the items came through personal contact of suffering individuals in the area of their destination. Miller said that assistance was provided by people as far away as Bowling Green, New Haven and Defiance. 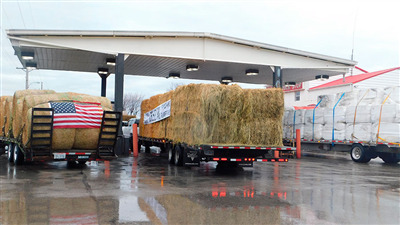 Brady and his father were taking a load of hay to Nebraska. The group joined in a time of prayer and then boarded their vehicles and started west. It was anticipated that they would sleep in Iowa on Friday evening.